Write in our Visitors Book! Your message will be emailed to us and a copy posted online here for others to read. We will reply here too, and if you enter your email address, a notification will be sent to you letting you know. If you need to contact us privately, please email contact[at]YachtTeleport.com. Please use the public form if you can, helping us share our experiences with others! What's the name of our sailboat? This is to stop SPAM. Thanks for your kind message 18 August 2018. Concerning the making of a possible documentary I should like to brainstorm this further with you, but, better via email. Please be so kind to send your email address direct to my email address. I have followed quietly all your travels and video's over the years. I have even re-watched them a couple of times. I did this again a few days ago. Then I remembered that once you mentioned that it was the idea to let a professional editor make a full length film about your adventures. From all the clips, you have only used probably only a fraction of them. Like to know if this is ever going to happen. Perhaps I missed something? Like to hear from you ...... Greetings, Frans Reijkersz from the Netherlands. Hi Frans! We too would like to know if that is ever going to happen! Haha. We seem to just always be too snowed under with other projects and things, and never have the time to get this doco project off the ground. We did want to do it ourselves but of course gave up on that.. We are yet to find any decent editor that is willing to take on the story too... ideally we'd find someone who was keen to take it on with a bit of a commission arrangement so that if the doco did well then they would get a portion of its earnings, rather than us having to fork out $thousands to get it made in the first place... But so far, no takers, and we haven't even had the time to go asking around for the last few years... super busy building our eco lodge SwellLodge.com - if you know of any doco makers who might be keen, we'd love to hear from them! Thanks! It really would be wonderful to see a watchable doco of the adventure! Thanks! That is awesome. We thoroughly enjoyed your Teleport videos and are looking forward to watching your new adventure unfold, even if it's sailing related. Perhaps we'll even make it to Christmas Island one day! Best of luck to you both. Congratulations on your new Christmas Island venture. 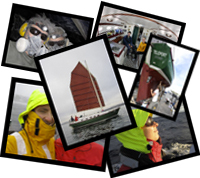 Looking back on your time aboard Teleport, what did you like about the North Atlantic 29? Dislike? In what ways will your next boat differ? Thanks so much for your message!! We loved our NA29 - in an ideal world our next boat would just be a 40ft version of her made out of aluminium - we have already designed it in our head but it's just a little unpractical to make. I think for long distance cruising I (Jess) would like a little more creature comforts next time like hot shower, fridge, freezer and stove that works. I would also like bigger windows so we could see bears walking outside while having dinner and another cabin for guests if we had friends or family who wanted to join us. It'll also be nice to have an anchor winch, a better system for lifting the outboard on/off etc. There wasn't much we disliked about Teleport, if we had more time and money we could have made her more comfortable but now we'll look for these comforts in our next cursing boat. Once the lodge is finished :) Thanks again for your communication. Thank you for producing such a wonderful site. Your adventures are an inspiration to millions. Wish you well on your future destinations. I will continue to enjoy travelling the world with you. I just finished rewatching of YT video. Hows the new product coming. Doe have a projected opening date. All the Best. I so miss y our videos. Thanks for your comment Regie! We don't have an opening date yet, hope that it'll be early next year!!! We'll keep everyone updated on the new Swell Lodge website. Thanks for watching our videos! Thanks for the update and for your environmental conscientiousness. May you have similar success with insight and sensitivity in regard to employer/employer relations and participation in the life of the indigenous human community of Christmas Island. Hi Byron. So great to hear from you!! Thanks so much for your good wishes!! Enjoy the Alaskan summer and keep in touch! Good news, busy bees. Fantastic project on Christmas Island. Worth following and perhaps visiting, if still alive, when completed. Is Swell Lodge newsletter included here? Please keep me on the list for future communications. Oh please keep me on your mailing list. Good on you, well done. I have been to Christmas Island as a tourist, it is indeed an amazing place. Your eco-lodge tempts me for a return visit. I first bought the book and have been following you ever since. Being 86 I can only watch and listen to your exciting travels. Great to hear from you both and fun to still be able to keep in touch with your new venture. Best wishes from us :) Nige and Margie.